McDonald’s Golden Arches. Harrods’ rich forest green. The Nike swoosh. Big-name businesses know how important it is to develop a signature color, logo, and style—and they spend loads of money make sure every element of their business is perfectly designed. Of course, small business branding is different: Small and medium-sized field service businesses don’t have loads of money. (Or loads of time, or loads or resources.) How can you compete with the big HVAC company, plumber, or property maintenance business down the street with their fancy logoed vans and their professionally designed invoice templates? We’re all about helping field service businesses grow, so we did the research on how to create branding and design that will help you draw in customers—without breaking the bank. There’s a lot more to building a successful brand than looks—for example, your communication style and customer service also play a role in how people see your field service business—but today we’re going to focus on the outer image only. Here’s how to use color and design to help your field service business stand out and get more jobs. 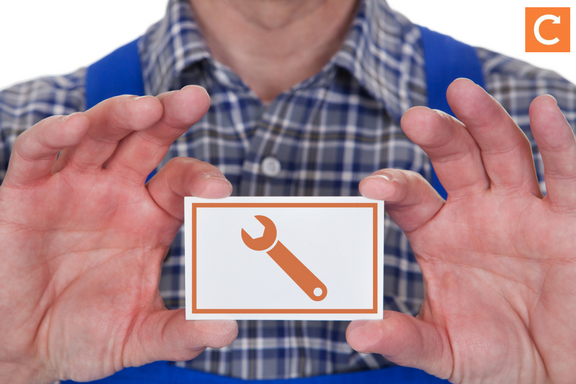 What elements do you need in a field service branding package? Letterhead and envelopes, if you mail invoices, reminders, etc. We suggest going paperless to save time, money, and the environment. Email templates. For example, if you use Mailchimp for your email marketing newsletter, you can have a designer create a customised email template. Vehicle wraps, stickers, or magnets. Consider what you’ll need to have designed for your business, and your designer can also guide you. And now for the steps to getting your image done right. 1. Please, we beg you, hire a designer. Everyone thinks they have ‘a knack for graphic design’, but much like some singers and dancers on reality TV, many of them are deluded. While free tools like Canva are great for creating blog images and banners, unless you have a graphic design background we recommend leaving your business image to the pros. A professional designer won’t necessarily empty your wallet; search online for ‘branding package’ or ‘branding identity for small business’ and you’ll turn up plenty of lower-cost options. Also, many small businesses like 99Designs, where you can get an entire brand identity package starting at £459. You specify what your budget is and what you need, designers ‘compete’ by coming up with designs for you, and you choose the winner. Still too expensive? Try bartering your services for graphic design, or hire a graphic design student from a local university. 2. Think about your colors and style. Your designer (if they’re good) will ask you plenty of questions about your business to make sure they design a brand image that actually fits what you do, how you work, and how you want customers to perceive your company. You’ll want to do some research on your own to help your designer along. For example, as you’re surfing the internet, shopping in real life, or reading a book or magazine, take note of what colors and designs you like. Look at what your competitors are doing, and what you like and don’t like about their brand images. Color plays a huge role in how customers see your business; for example, red comes across as exciting but also low-cost. Green is seen as peaceful and environmentally friendly, and black is powerful and classy. If you’re stuck, Digital Marketing magazine has a good article on how color affects purchasing decisions. Keep in mind that a logo and other design elements will need to look good not just in your designer’s sketch, but also in black and white, on paper and online, and in large and small formats. Here’s a surprising fact: Small businesses sometimes have an advantage over huge companies and chains, because many customers want to do business with independent, authentic brands—so much so that a lot of chains are trying to look like small local businesses. 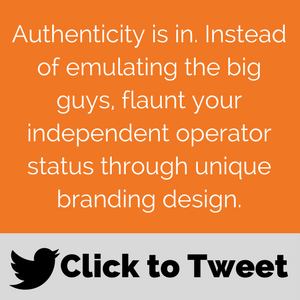 So instead of copying the big guys, MarketingDonut suggests flaunting your independent operator status through unique branding design. 4. Turn your new design into a marketing opportunity. Your designer may offer you several different designs to choose from or tweak. 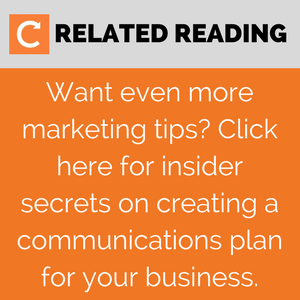 Why not put on a contest for your customers and prospects? Post all the designs on your business’s Facebook page or send them to your email list, and ask people to vote on their favorite. Offer a prize, like a free boiler check-up, to a randomly selected voter. (Random.org has a True Random Number Generator; number your contest participants, enter the lowest and highest numbers into the generator, and click Generate. The number that turns up is your winner!) And don’t forget to post/email the winning design and thank your voters, which is yet another opportunity to reach out to your customers! 5. Start showing off your new image. The header and footer of your emailed invoices, purchase orders, appointment confirmations, and service reminders; for example, if you’re a Commusoft customer, you can customise these to look pro to your customers. Tshirts for your team or as gifts for your customers. Cafepress is a good place to have these made; you can buy them at a discount to use in your business, or even sell them through the site. Promotional giveaway items like mugs, mouse pads, or even a workman-shaped stress ball. Your blog images. For example, notice how we have the Commusoft logo in one corner of our blog images. In many cases, you can save cash by doing it yourself, such as uploading your new logo to your business Twitter profile or designing mugs and Tshirts through sites like CafePress; in other cases you’ll want to hire a professional, such as for creating signage or adding your logo to your service vans. Another big part of your branding is your website. That's why we created Build a Better Website: A Complete Kit for Field Service Businesses. You’ll get expert insight on how to choose a domain name, the simple way to do SEO, and more—plus a thorough checklist that will help you build a customer-grabbing website for your field service business. Download your free Kit by clicking the banner below!